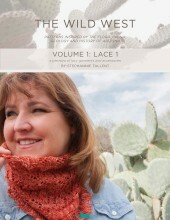 The Wild West e-books LACE 1, CABLES, STRANDED,TEXTURED, and LACE 2 are now available. Single pattern PDFs are also available. The desert has a beauty all its own. Colors are often muted, softer, a bit dustier: but then you get flashes of turquoise sky or red rocks with a vibrancy that shimmers. Although I was born in California, and California is home, I lived in Arizona for quite some time—from 5th grade through high school in Phoenix; then, after graduation from West Point, for six or so months for my Military Officer Basic Course at Fort Huachuca. My heart belongs to the Pacific coast, but there is a part of me that loves the desert, too. 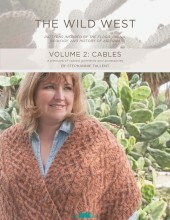 The Wild West collection spans my knitting interests: cables, colorwork, textures, and lace. 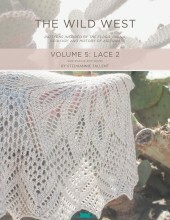 In LACE 1, I explore using lace in garments, socks, and cowls. CABLES is just that: lush cables in garments, a stole, socks, and a hat. STRANDED lets you play with color and textured to create both lovely and whimsical projects. 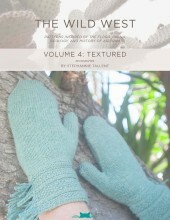 TEXTURED lets the qualities of the yarn shine with various accessories, perfect for gift giving. LACE 2 is filled with gorgeous shawls worked in luxury yarns. 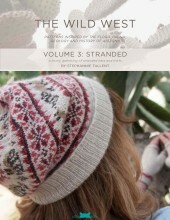 Tutorials include beading, duplicate stitch, and I cord as applicable to the patterns in the e-books. Join my newsletter to be notified of e-book and pattern releases, preorder specials, and more.